This article is about those outpatient clinics that are not connected with hospitals. For outpatient clinics of hospitals, see Outpatient clinic (hospital department). For inpatient healthcare facilities, see general hospital. For the British political term, see Surgery (politics). For other uses, see Clinic (disambiguation). Military Polyclinic in Legionowo, Poland. A clinic (or outpatient clinic or ambulatory care clinic) is a healthcare facility that is primarily focused on the care of outpatients. Clinics can be privately operated or publicly managed and funded. They typically cover the primary healthcare needs of populations in local communities, in contrast to larger hospitals which offer specialised treatments and admit inpatients for overnight stays. Most commonly, the English word clinic refers to a general medical practice, run by one or more general practitioners, but it can also mean a specialist clinic. Some clinics retain the name "clinic" even while growing into institutions as large as major hospitals or becoming associated with a hospital or medical school. Some clinics are operated in-house by employers, government organizations, or hospitals, and some clinical services are outsourced to private corporations which specialize in providing health services. In China, for example, owners of such clinics do not have formal medical education. There were 659,596 village clinics in China in 2011. Health care in India, China, Russia and Africa is provided to those countries' vast rural areas by mobile health clinics or roadside dispensaries, some of which integrate traditional medicine. In India these traditional clinics provide ayurvedic medicine and unani herbal medical practice. In each of these countries, traditional medicine tends to be a hereditary practice. The word clinic derives from Ancient Greek κλίνειν klinein meaning to slope, lean or recline. Hence κλίνη klinē is a couch or bed and κλινικός klinikos is a physician who visits his patients in their beds. In Latin, this became clīnicus. An early use of the word clinic was "one who receives baptism on a sick bed". The function of clinics differs from country to country. For instance, a local general practice run by a single general practitioner provides primary health care and is usually run as a for-profit business by the owner, whereas a government-run specialist clinic may provide subsidised or specialised[dubious – discuss] health care. Some clinics function as a place for people with injuries or illnesses to come and be seen by a triage nurse or other health worker. In these clinics, the injury or illness may not be serious enough to require a visit to an emergency room (ER), but the person can be transferred to one if needed. Treatment at these clinics is often less expensive than it would be at a casualty department. Also, unlike an ER these clinics are often not open on a 24 × 7 x 365 basis. They sometimes have access to diagnostic equipment such as X-ray machines, especially if the clinic is part of a larger facility. Doctors at such clinics can often refer patients to specialists if the need arises. Large outpatient clinics vary in size, but can be as large as hospitals. Besides GPs, if a clinic is a polyclinic, it can house outpatient departments of some medical specialties, such as gynecology, dermatology, ophthalmology, otolaryngology, neurology, pulmonology, cardiology, and endocrinology. In some university cities, polyclinics contain outpatient departments for the entire teaching hospital in one building. 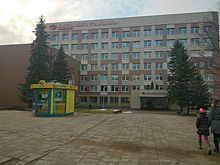 Large outpatient clinics are a common type of healthcare facility in many countries, including France, Germany (long tradition), Switzerland, and most of the countries of Central and Eastern Europe (often using a mixed Soviet-German model), as well as in former Soviet republics such as Russia and Ukraine; and in many countries across Asia and Africa. Recent[when?] Russian governments have attempted to replace the polyclinic model introduced during Soviet times with a more western model. However, this has failed. India has also set up huge numbers of polyclinics for former defence personnel. The network envisages 426 polyclinics in 343 districts of the country which will benefit about 33 lakh (3.3 million) ex-servicemen residing in remote and far-flung areas. Polyclinics are also the backbone of Cuba's primary care system and have been credited with a role in improving that nation's health indicators. There are many different types of clinics providing outpatient services. Such clinics may be public (government-funded) or private medical practices. In the United States, a free clinic provides free or low-cost healthcare for those without insurance. A retail-based clinic is housed in supermarkets and similar retail outlets providing walk-in health care, which may be staffed by nurse practitioners. A general out-patient clinic offers general diagnoses or treatments without an overnight stay. A specialist clinic provides advanced diagnostic or treatment services for specific diseases or parts of the body. This type contrasts with general out-patient clinics. A sexual health clinic deals with sexual health related problems, such as prevention and treatment of sexually transmitted infections. A fertility clinic aims to help women and couples to become pregnant. An abortion clinic is a medical facility providing abortion and related medical services to women. An ambulatory surgery clinic offers outpatient or same day surgery services, usually for surgical procedures less complicated than those requiring hospitalization. Tavistock Clinic, part of the British NHS, was founded in the 1920s. One of its most celebrated members was R D Laing. The Suitcase Clinic, the Berkeley Free Clinic, and the Haight Ashbury Free Clinic are examples of free clinics. Christian Medical College & Hospital in Vellore, India has extensive roadside dispensaries and began as a one-bed clinic in 1900. The Edmonton Clinic is a joint venture of the University of Alberta and government health care body Capital health, expected to be completed in 2011. The Shyness Clinic founded by Zimbardo to assist those disabled by public or private shyness. La Borde clinic in the Loire valley France, is an innovative psychiatric clinic where patients are liberated to actively participate in the running of the facility. The Mayo Clinic, Cleveland Clinic, Marshfield Clinic and Lahey Clinic are examples of comprehensive health care systems, all having begun as much smaller group practices that have since grown into large medical programs in the United States, whilst retaining their names. The Gary Burnstein Community Health Clinic, a non-profit, volunteer-supported Free Clinic in Pontiac, Michigan. The Balaji Physiotherapy & Rehabilitation Clinic "for muscle, joint, back pain, stroke and spine rehabilitation treatments" in Jodhpur, Rajasthan, India. ^ κλινικός in A Greek–English Lexicon. Retrieved 2016-09-18. ^ clinicus in A Latin Dictionary. Retrieved 2016-09-18. ^ Partridge, Eric. Origins: A short etymological dictionary of modern English. Book Club Associates, 1966. ^ Clinic, Webster's Revised Unabridged Dictionary, 1913. ^ "Clinic search engine tools to find the right Clinic". 123 clinic. Retrieved 15 December 2016. ^ NLH – Health Management – Policlinics. Retrieved 3 July 2008. ^ Ershova I, Rider O, Gorelov V (December 2007). "Policlinics in London". Lancet. 370 (9603): 1890–1. doi:10.1016/S0140-6736(07)61793-0. PMID 18068500. ^ "199 Additional Polyclinics For Ex-Servicemen". The Hindu. Chennai, India. 26 May 2010.